On Saturday as part of a good half-day’s birding I explored Jamaica Bay hoping to find some birds that have come in with the warm weather that I could count for my Anti-Global Warming Big Year. I didn’t find too much that I haven’t already seen this year, in fact, a Little Blue Heron was the only totally new bird for the year. Glossy Ibis, Greater Yellowlegs, Laughing Gull and Forster’s Tern were all added to my year list though as the only previous sightings I had of them were aided by getting rides in cars. What does all of this have to do with Fish Crows? 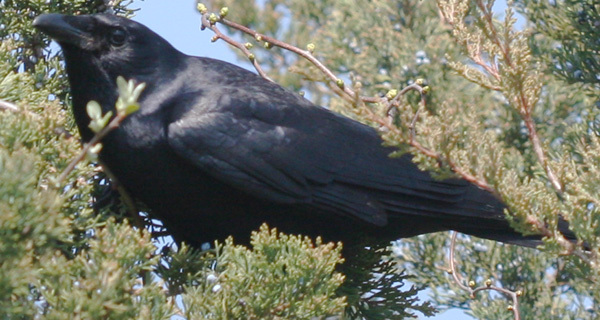 Well, nothing, except that while I was finding all of these birds at Jamaica Bay I also came upon a Fish Crow perched in a tree, eating tree buds. Then it flew to a cedar tree and started eating cedar berries. 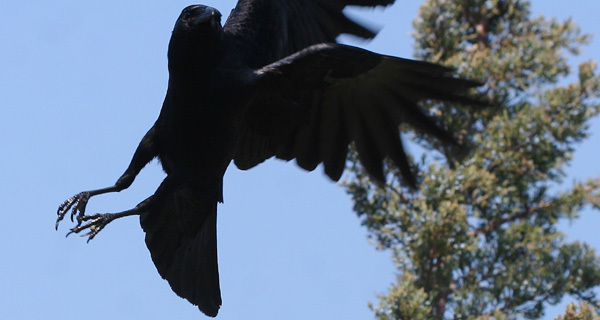 I have always had a tough time photographing crows or ravens as their all-black bodies tend to defy my picture-taking abilities. Even these shots are not as nice as I could hope for, but they are better than the usual black, bird-shaped blob that usually is the result when I release the shutter around these crafty corvids. When I lived upstate in Albany we found Fish Crows by going down to the Hudson River and waiting to hear their nasal “Caa” which was easily distinguishable from the harsh-sounding “Caw” of American Crows (if you want to learn more about distinguishing the two check out Jochen’s post from last August which includes some information on the subject). Down here in New York City Fish Crows can be readily found virtually anywhere along the coast and seem to be more common than American Crows. 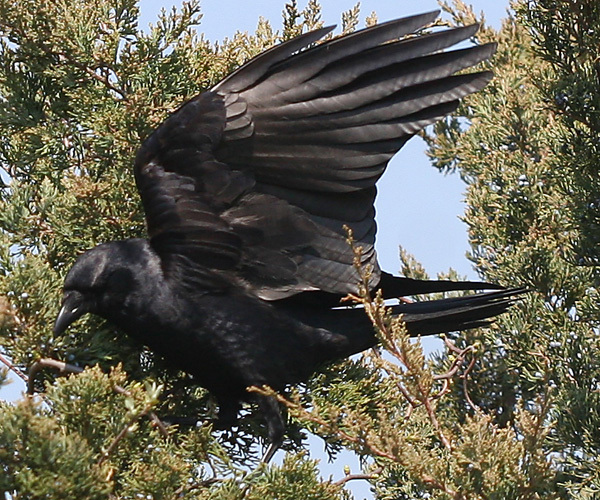 And despite the fact that Fish Crows, like all corvids, are opportunistic feeders that will eat almost anything that they can fit in their mouth, I had never found one eating cedar berries, or any kind of berry, before. It was fun to watch such a (relatively) big bird delicately eating the berries one at a time. The watching didn’t last long though, and the Fish Crow, despite being more cooperative than any I had ever seen before, winged away, emitting a couple of “caas” as it went. Wow! That last pic is amazing! Totally cool! See the main problem with taking pictures of those dar…ling black birds? The eye, the evil eye!! Thanks for linking to my post on how-not-to-twitch-fish-crows, those (yours) truly are remarkable pics!! I also particularly li,e the last picture. Your pictures are remarkable! I love painting crows/ravens and I see many colors in your birds.